We need prayer – like breath and water. It keeps us alive. Last night I went to Africa. I didn’t catch a midnight flight out of Nashville International and head to Lagos, although I confess I might indeed do that sometime in the next year if God works things out for me. Rather, I depended on the experiences of others, friends who made a pilgrimage to Africa a year ago, and come home transformed by the experience. Last night, I had the opportunity to see a film of their experience, and hear about their belief that it is time to pray with Africa. A team of college students will be presenting this film up and down the Eastern U.S. this fall, and I encourage you to check it out if you have the opportunity. 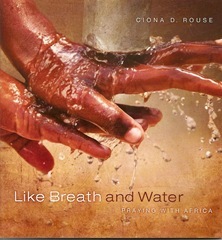 Ciona Rouse is one of those friends, and in conjunction with the movie, she has just released a book, Like Breath and Water: Praying With Africa, about her experiences in Africa (published by Upper Room Books). Certainly, I picked up the book last night because of my friendship with Ciona and my love of her past writing. And given my past tendencies, it would have been likely that this book would end up on shelf, unread until I could find the time. But the images from last night wouldn’t leave my head, and I found myself sitting on the sofa in my office reading Ciona’s story, a story that I encourage you to read as well. Like many of us, Ciona traveled to Africa with all sorts of generalizations and stereotypes about what she would find there. She and her friends Cary and Austin were prepared for the suffering and poverty they would experience, and it continues to be present in major ways throughout the continent. What they didn’t expect were the stories of Africans who weren’t weighted down by their oppression, but rather were bearing it with grace and dignity, as well as working together to overcome it. The Africans they experienced weren’t looking for handouts. No, they were looking for relationships, prayer partners, and those who would share in their story. Most of all, Ciona, Cary, and Austin experienced prayer in a way that was radically different from their prayer experiences in the privileged yet distant U.S. The people I encountered has an enormous amount of patience with God; when it came to trusting God’s promises, my new friends waited faithfully for God to deliver. Without hurry or worry, they simply prayed and followed God’s timing day by day. This is a book about Africa, but it is ultimately a book about prayer. It isn’t especially deep, in fact the storytelling style almost has a child like quality to it, but it is in the simplicity that we experience God in Ciona’s story. It’s also a beautifully produced book, filled with photographs from Africa that can be the source of many day’s meditations. Last night, I went to Africa. Maybe soon, I will begin to learn to pray.